The following release notes are for the Cross Market Divergence Indicator. 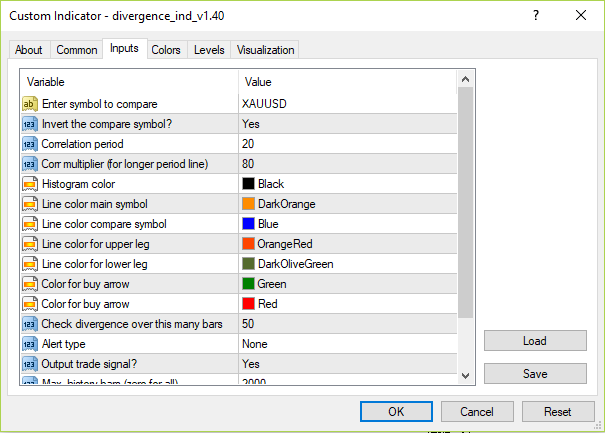 Place the divergence indicator onto the required chart and in the settings box enter the symbol of the market to compare – e.g AUDJPY. Enter the symbol exactly as it appears in the MarketWatch. Important: If the markets are inverse to one another (one rises when the other falls) the “inverse” setting should be used. The indicator will output a warning message if the markets are inversely correlated but the inverse setting is not switched on. If too many or two few divergences appear, adjust the settings below accordingly. 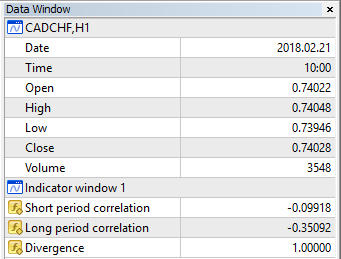 If no output is shown, make sure that the Metatrader history exists for both charts on that time period and that the compare symbol is entered correctly. Alerts can be created and these will notify of any new buy/sell events that appear on the chart. Mobile and email alerts will only be sent if you have this option set up in MetaTrader. The indicator will output a trade signal according to the input settings. This will output values for the correlation between the markets. The divergence output will be on whenever the two markets are diverging beyond their average limits. The signals are set to the predefined “empty values” setting when no marker is shown. If the inverse setting is on, the buy/sell signal for the compare market will refer to the inverted symbol. For example, if the compare symbol is GOLD/USD inverted (USD/GOLD), then a buy signal means sell GOLD, and a sell signal means buy GOLD. Invert the compare symbol? Invert the compare symbol (yes/no)? Output trade signal? Output the buy/sell arrows onto the chart (yes/no)? The only mandatory setting is the compare symbol. Enter the compare symbol exactly as it appears in the MarketWatch window. The other settings have defaults which should be suitable for most charts. Adjust the settings accordingly for smaller or larger timeframes where needed. Check there is correlation between the markets in the lower window. The indicator will only give meaningful results were a strong and consistent correlation exists between the two markets. The correlation can be either negative or positive. With a negative correlation, switch the “Invert” setting on. The indicator will display the text and arrows on the chart if this setting is switched on. The labels are set according to the initial window size. If you resize the chart or switch chart or timeframes, and the labels appear out of alignment, just refresh the indicator by opening the settings box. For further information please see the product page and articles on the website which describe various divergence strategies.